Why does our competitors' stuff look so flat? So there is a real opportunity to break through. To treat your business customer like a person she is. To not pretend that she turns into a purely logical automaton when she dons her security badge and freshly-dry cleaned shirt. To use the same smart, emotive consumer ethic you'll market to her with when she's sitting on the couch watching American Idol later that same day. To care about connecting with her. 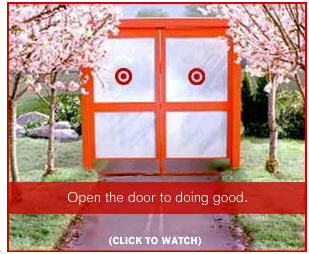 Target Corporate Responsibility Ads: A miss? It is possible that the next World War will not be fought by proud countries, but rather be a heroic battle for global dominance between the two true gladiators of our time: Target and Google. Like much of the rest of corporate America, Target is on a 'good citizen' kick lately. Racking up comp points with talk of philanthropic programs and charitable causes. Jump to: These online ads (above) driving traffic to their 'do good' page. Cute design, right? But quite misleading and a good cautionary tale for other Web advertisers. Misleading call to click: We're a nation of multimedia. We toggle sound and video on and off. 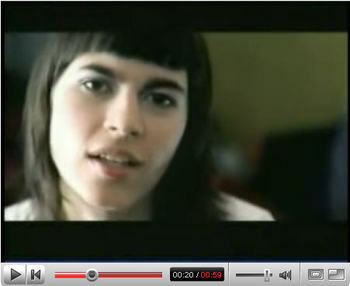 We've been trained by advertisers to believe 'click to watch' means just that - a video will begin playing in the window. And, we appreciate that functionality - because it gives us the choice rather than overwhelming us with noise and causing us to smack the mute button on our laptops. But, this target ad is actually a flat banner. Click to watch takes us to target.com. 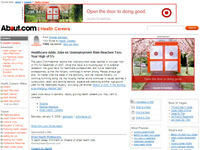 The resulting community page features a few rollovers and a lot of reading. None of the promise of the call-to-action is fulfilled. Missed opportunity for interaction: The graphic is a door. The words are open the door. The strategy is to evolve consumers overall categorization of the Target brand. Come on, show us something. Let's slide open the door to change. Let's rollover to interact. Let's re-purpose that experience on the Web site in a much more in-content way. Here it is: Meet Pointroll. Meet Eyewonder. Do better. Or, a possible alternate to #2: Not optimizing message to the medium. Once an ad is approved, it's all too common to simply route it universally. If 80% of your media buy accepts the multimedia ad designed, the other 20% just gets a flat JPG of the same creative. Fully branded page, not fully integrated page: Target definitely owns share of voice on this page. They have covered it with banners. But, are they saying anything with that megaphone? And are the impressions building on one another to say something about the brand? We've all seen the darn-near-perfect Apple ads. And, surely there are learnings there that can be applied cost effectively. As an ad girl at a retail shop I get my fill of holiday cheer by oh-right-about October 1. By then, the hoopla has been in full swing since balmy July when reindeer were being sprayed down on a set that tested the limits of modern air conditioning. Spring forward to the week before Halloween. Retailers finally get to debut their holiday TV spots to a consumer populace that's not ready for them and an ad community that's already over them. Lowe's is recycling their "I'm looking for..." spots. The cute idea where a harried shopper hits the store unable to remember the name of the holiday home adornment she's hunting and launches into a charades-style pantomime which the savvy sales girl immediately guesses as a giant inflatable with life-size santa and reindeer. Clever idea. Slightly annoying talent. Highly over-exposed spot here in year 2. First up, let me say, I like the strategy. They're setting themselves in direct opposition to every other big box - from the Depot to Target. It's story about service and knowledgeable sales staff. It is targeted at a busy, high income, high expectation female customer. I love that. But, America has seen it. And with talent that grating, there's a good chance they'll miss the highlighted product as they lunge for the fast forward button. I'll talk my agency bosses into slashing our fee in half if you give us a shot at reinventing the spots. There's still time for a holiday miracle ... call me! Standard navigation for business clients first visiting the sites. You know, the clients we don suits for as if we're really bankers, too, but then send to our quirky, Flash-based, impossible-to-use Web sites to learn more? Plus, fun bottom navigation that once turned on has all the experience schtuff that compels longer browsing and a little cool factor. This site has survived many iterations and seems to be on a solid upswing. Again, the logical and explorative nav choices. Plus, mini case studies for our ROI-driven world. 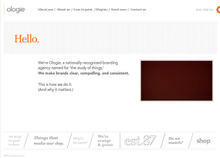 A solid, unified brand experience throughout. Some products just really don't need to be broken down to their component parts by representative humans hurling about to a booming score. "I want to be one less. One less." A little melody so annoyingly memorable that you'd think it was in a Target spot. This Merck spot has been running since February or so and every time it comes on, I am completely distracted by the casting. How does being HPV-free correlate to having really, really horrible eyebrows? The full range of eyebrow errors is displayed: from huge, untamed caterpillars to over-plucked bald foreheads. I cannot look away. It's like a mangled, burning car on the side of the road. Hyper-caffeinated creative director: We're selling a $360 product to girls 9 - 26. Get it? This can't look like an over-produced spot. These all look like models. Where's the authenticity? Pissed off copywriter: We've talked about this a hundred times. It's still TV - they have to look aspirational. The script will deliver the authenticity. Guy who knows he has to give the presentation: Maybe we just give them all one thing - one signature that makes them look more accessible. Like ... I don't know... cut off jeans. Hyper-caffeinated creative director: Yeah, but something more physical. Something that separates them from models. What about eyebrows... big bushy eyebrows. Guy who knows everyone: Perfect, boss. I know the makeup artist who made Ugly Betty ugly.